When most of us are 16, our biggest worries are getting our drivers license or figuring out our date to the prom. When Staff Sergeant Jerry Ingram was 16, he was a combat tank commander with Company C of the 4th Tank Battalion, 4th Marines, preparing to fight his way to victory across the Pacific to Japan. This is Jerry’s story. Jerry was born on May 20, 1927, in Kansas City, Kansas. Scraping by at the height of the Great Depression, Jerry left home when he was 10 and lived on the streets. He made enough money to survive working on local farms, but after the Japanese bombed Pearl Harbor on December 7, 1941, Jerry enlisted in the Marines when he was only 15. He was a big kid at 6 feet tall and 200 pounds, just what the Marines were looking for. Jerry says he lied about his age to get into the Marines, and he’s been lying about his age ever since. Jerry reported for duty on November 9, 1942, and was sent to Marine boot camp in San Diego California. He lived in a tent his full time there, and would continue to live in tents all the way through to the end of the war. Jerry said his drill instructor was a Pearl Harbor survivor, which made him especially tough on his men. Whatever the requirements were, he made them do more. At the time, Jerry thought they were being over-trained. Looking back, he attributes a significant part of his survival to his Marine Corps training, which taught him to never give up. The rest he knows is due to the hand of God. Jerry is certain God has allowed him to survive so he can relay his story to others, so that they, too, can learn to never give up. One story stands out for Jerry from boot camp, where there was significant competition between platoons to outdo each other. On the night before the final inspection and graduation parade, Jerry and some buddies from his platoon took permanent shoe die and painted black mustaches on sleeping Marines in the other platoons. Then they painted mustaches on themselves so no one would know which platoon did it. Jerry said you can only imagine the reaction the next morning when the new Marines showed up for their graduation inspection with mustaches painted on their faces. After boot camp, Jerry reported to the Marine Corps camp at Jacques Farm, also in San Diego. He thought he was going for Raider training, but he learned when he arrived the camp had just been repurposed to train Marines to fight with tanks. By the time he left Camp Jacques, still at the age of 15, he had become a tank driving instructor. Jerry fought in these battles as a commander of a Sherman tank, which was the main battle tank for the United States during the war. He recalls that when they conducted the Roi and Namur Island landings, U.S. Navy ships offshore mistakenly fired on their tanks. To prevent that from happening again, someone up the chain of command came up with the idea to paint the tops of the tanks yellow so they could be easily identified from the air. When the tanks landed in Saipan, they learned the hard way that the new paint scheme was not such a good idea. Jerry and his tank Company had landed in the wrong place, so they got out of their tanks to check their maps to see where they were. Suddenly, Japanese shells rained down on them because the yellow tops made them easy to spot and target. When the shells started coming in, Jerry and a Gunnery Sergeant (Gunny) jumped under one of the tanks and the tank took a direct hit. The Gunny said he was hit, and Jerry reached over and felt blood all over the Gunny’s leg. Despite being in cramped quarters and unable to see because they were under the tank, Jerry managed to get a tourniquet around the Gunny’s leg. When the shelling stopped, Jerry pulled the Gunny out from under the tank only to find that it wasn’t blood on the Gunny’s leg, but warm diesel fuel that had leaked from the tank after it had been hit. After securing Saipan, the 4th Marine Division returned to its base on Maui to prepare for their next assignment: Iwo Jima. This proved to be one of the costliest battles of the war and the only battle in the Pacific where more American attackers were killed than Japanese defenders. Jerry remembers going to the cemetery on the island after the island was secured and being overcome by the thousands of crosses marking the graves of his fellow Marines. He says this was the only time he cried during the war. After surviving these horrific island-hopping battles, Jerry was transferred to the 1st Marine Division in Tientsin, China, as part of the occupation forces securing the area after Japan surrendered. Jerry said the Chinese people were destitute, having suffered greatly at the hands of the Japanese. 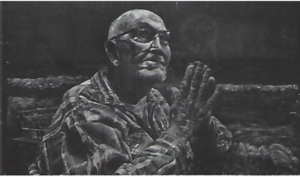 He saw people stripping bark from trees to eat and using sand as filler in some of their meals. Yet when the Americans shipped food for the starving people, corrupt local officials kept it from those who needed it most. Jerry returned to the United States from China and was honorably discharged in 1946. He still suffered from the effects of the war, especially amoebic dysentery, which plagued him for years. Amoebic dysentery is caused by a one-celled organism that invades the intestines, resulting in severe abdominal pain, diarrhea, and blood loss. Further complications occur when the parasite gets into the bloodstream. Early on, Jerry’s infection was so bad that he went to the VA Hospital in Leavenworth, Kansas. At one point he overheard that he was in the St. Peter’s room, which meant he was not expected to live. But the Marines had taught him to be a survivor, and if the VA Hospital couldn’t help him get better, he would go back home to Kansas City and try something else. So he snuck out of the hospital wearing nothing but his hospital gown with the ties in back, and hitchhiked to Kansas City. As he looks back on it now, he can’t believe someone actually stopped and gave him a ride given how he was dressed. Jerry recovered and went back to school to complete his education. Not only did he get his high school degree, but he also used the GI Bill to get his bachelor’s degree from Kansas University. As if Jerry’s experience in the war wasn’t enough, he had two other close calls with death. First, when Jerry was 25, his car was hit head on by a drunk driver. Jerry suffered massive head trauma and was in surgery for 23 hours. He eventually had an acrylic plate put into his head and he had to re-learn his memory, but he never gave up and he recovered. Then, in 1981, he was caught in an elevator with 3 other men when an arsonist set fire to the Las Vegas Hilton. When the elevator door opened, Jerry crawled to safety, but the 3 other men, who tried to run through the smoke, died from smoke inhalation. Jerry attributes his longevity to the Marines who instilled in him that he must never give up, no matter how bad things get, and his faith in God as a Christian. He feels duty-bound to tell people his story so they understand that there is a cost to the freedoms we all enjoy. When I asked Jerry if he thinks serving in the military is a good option for young people today, he didn’t hesitate. He said there is no greater honor than serving God, Country and the Corps. He is a Marine through and through, who knows and appreciates that next to life itself, freedom is the most precious gift we have. At almost 91, Jerry still works full-time at Jerry Ingram Fire & Rescue, providing fire departments with uniforms and other required first responder equipment. He also supports the American Legion and Veterans of Foreign Wars, and is active in the Marine Corps League. 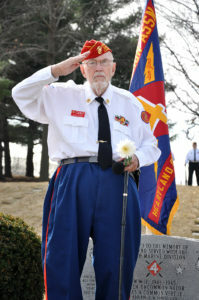 He remains the driving force behind a memorial and annual remembrance ceremony in March for the battle of Iwo Jima at Leavenworth National Cemetery in Kansas. 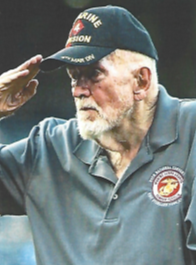 Voices To Veterans proudly salutes Staff Sergeant Jerry Ingram for his distinguished service in the United States Marine Corps and for his lifelong commitment to preserving the freedoms of every American. There is no doubt how Jerry would close out his story if he were telling it in person: Semper Fi! 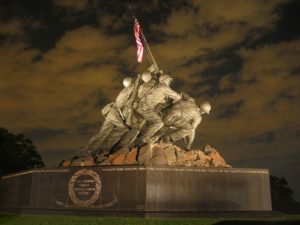 U.S. Marine Corps Memorial in Washington, DC. 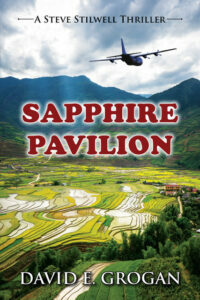 Click here to order your own signed copy of Sapphire Pavilion now!